Once the application would be installed successfully, the user would first sync the main master data from the main database which would basically import users, corporations, councils, committees and any other master data into the app’s local database. On successful sync of master data, the surveyor can login as per the credentials given to him / her by SUDAH. On login, the home page would have options to add a new homeless record or search for an existing one. During survey the adding of a new record would be done by filling in step by step details with each step capturing a few details. The most crucial details were capturing the person’s name, photo using the phone camera functionality and capturing the location where the record is being added using GPS location of the phone. The photo and GPS location add to the credibility of the survey being carried out. The app would function even if there is no internet and the can push data to the main database once internet is available. The survey has to be carried out across various corporation, councils and committees. The survey would be carried out three times at the same locations as in the first instance. Any new records would be added and the ones which were already added during first or second survey would be marked as homeless the 2nd / 3rd or 2nd time respectively. 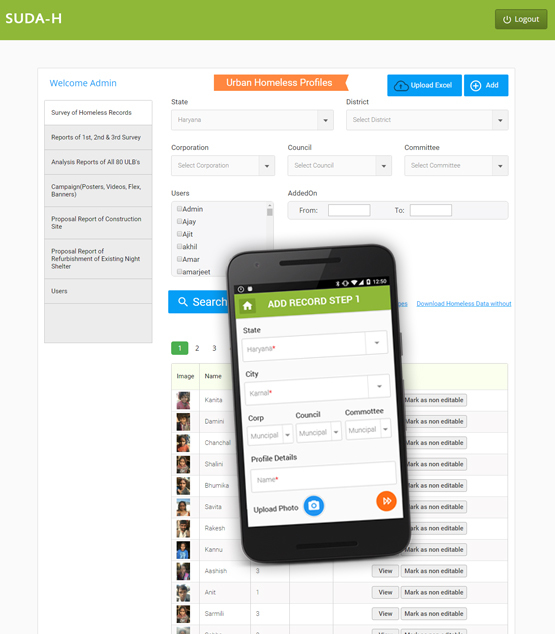 The app would also record any dependents associated with a homeless person and consequently add the associated dependent records as well through the app and the respective data would be related to each other. Can edit the record unless it has been marked as “non editable”. Can mark the person as being fund homeless second or third time during the respective survey cycles. The main purpose of the web portal was to be able to provide access to the homeless survey data to various stakeholders of this initiative to provide homes to the urban homeless population. To achieve the main objective of the portal, a comprehensive search facility as well as access all records was available for the personnel in charge. Using this portal, the user would also be able to download complete homeless records data into a spreadsheet. A homeless record could be added through the portal as well as it had the facility of bulk importing the records through a spreadsheet. The detailed view of each record was available through the web portal and if found to be correct it could be marked as “non editable” so that the survey cannot make further changes to it. This was to ensure that none of the collected data gets deleted or updated incorrectly. The web portal also had custom reports to display the homeless count across various towns / districts as well as count based on the number of times people were found homeless. The web portal also had provision for uploading any other analysis reports, videos, images, proposal reports , etc associated with this initiative for identifying the urban homeless and providing them with shelter. Lastly any survey users were also created through the web portal.